Call Our Customer Service… It’s A Rewards Center! Yet another example of customer service gone wrong implementation that I had stumbled on this morning. My wife ordered some of her stuff online from HSN.com, order arrived in two pieces, one of them wrong. It happens. This morning I fetched a customer service phone number from order’s e-mail and wrote it for her so she could call and request an exchange. As I was leaving I heard her dialing the number and… guess what? An overly-cheery loud and annoying female voice happily announced that she has reached a rewards center, “probably by mistake”. Right… hung up the phone, double-check the number and dialed it again. Oops. Same voice, same message. I stopped, went into HSN’s web site to check the number. Yes, we’ve got the number right, but it still says “rewards center”. After trying out a few other numbers, we figured the right one. Customer service rep helped my wife out, doing whatver it is they’re supposed to do in order to fix such an issue. However, the problem remains the same – why would someone post a rewards center phone number as a customer support? My guess is it was some marketing genius that decided it was an easy way to upsell existing customers. From my stand point – it is not. Broken Images In Firefox – Fixed! Last few months I was hunted by some weird problem on my laptop‘s Firefox – random broken images. What was even more strange is that on the same page after each reload a new image (or group of images) could be broken. The issue was solidly recurring, but affecting random images and random web sites. Uninstalled both Firefox 2 and Firefox 3 from my laptop, wiped caches and other leftovers and installed Firefox afresh. Same issue. Again! On the verge of dumping Firefox in favor of something else (Chrome/Opera/IE?) I realized that there’s a number of Firefox plug-ins that might have a say in this issue. Once I remembered a list of plugins I have been restoring from the backup every time – I got the rogue plug-in almost instantly. LiveHTTPheaders, when POST is set to “Fast” dumps some of the slow-loading images. It doesn’t mean that only large images affected – I had spacers lost and design all messed up with hours spent hunting down bugs in old web site designs. 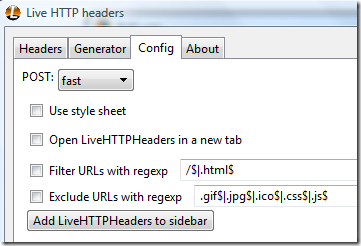 Live HTTP headers config screen – That’s where the problem is! So, if you have a similar problem of Firefox not displaying all the images on a web page and you are using LiveHTTPheaders plug in – set the LiveHTTPheaders POST setting to “Full” (or uninstall the extension if you don’t really need it) – and your Firefox automagically will be healed!